I’m really pleased with how well my UK leg went and really grateful to DPD staff for showing me around. My next destination is Dublin for 4-5 days. Ireland to my knowledge has nothing to do with date production so why would I go there? This leg of my Nuffield journey I have dedicated to personal development. My objective is to visit the land of my ancestors to gain an understanding of the reason behind them leaving their families and the Irish landscape, to migrate to Australia. My parents have documented the family history from the time of the first immigration but all connection to the distant family line in Ireland has long been lost. The first Reilly family members to migrate to Victoria came in the 1840’s when Melbourne had a population of only about 3000. That original family lost half its members to disease on the voyage out. 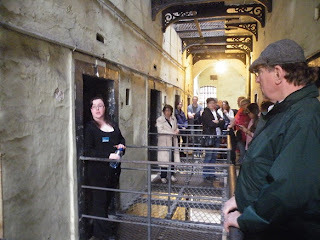 My first stop here in Ireland was the Kilmainham jail in Dublin. 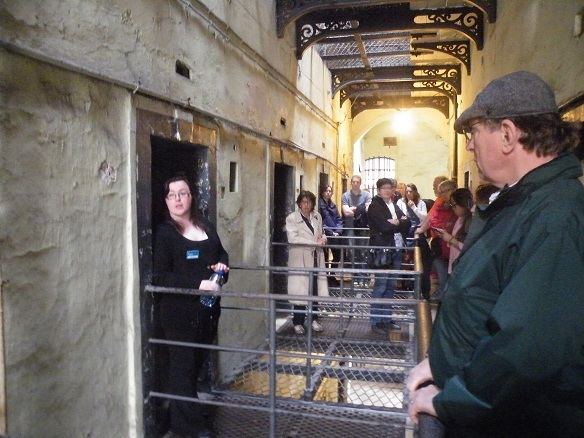 It is now a museum conducting tours but was once a notorious jail. 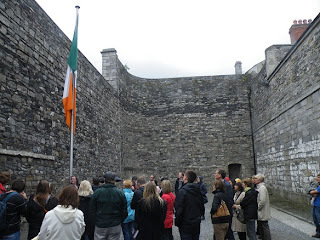 I wanted to gain an understanding of Ireland’s oppressed and bloody history. There have been no less than 5 uprisings dating back to the 1600’s. Mostly to do with the native Irish being unhappy with living conditions under British landlords. This jail housed political prisoners along with hardened criminals. Children young as 5 were also admitted for petty crimes. It was built to house 300 but in one year alone had 9000 intakes. This was mainly due to people trying to be arrested because in jail at least they were entitled to 2 meals a day and medical supervision – better than on the outside during the time of the great famine in 1845-1855. Many prisoners faced deportation to Australia and the US. The personal situation and my family’s reasons for migrating to Australia are unknown however the year of their immigration occurred during the great famine so it’s highly likely to have influenced their decision. They possibly may not have had much choice but what would have been known to them was the great risk of not surviving the journey on disease ridden ships. Many who took the voyage were never heard of again as the dead were thrown overboard. As it turns out, the first Reilly family to immigrate lost the wife and 2 children on the voyage, leaving the husband and 2 children to start a new life in a strange land. I can’t imagine how harsh life would have been leading up to the time of leaving Ireland and the difficulties of beginning a new life in a strange land. The sacrifice was immeasurable and I am certainly grateful for the events which have evolved and provided my family and I with the opportunity to enjoy a comfortable, stable life. I visit out of respect for my ancestors. So with no known living relatives and no idea of which part of the country the original family even came from, where could I possibly begin? I had some incredibly good fortune. After touching down at Dublin airport I lined up in the taxi queue and on hopping in a taxi noticed the driver’s ID card read ‘Bob Reilly’! I asked him where I needed to travel to in order to find the origins of Reilly. He started singing ‘Come back Paddy Reilly to Ballyjames Duff.....’ which he explained is a familiar Irish song. Ballyjames Duff is in County Cavan near Cavan Town. Bob told me every second person in Cavan Town is a Reilly – that was a good enough lead for me. Next day I boarded a bus to Cavan Town, 2 hours from Dublin. I would be satisfied with a quiet walk through the cemetery to read headstones and give me a feeling of connection. When I arrived in Cavan Town I was told to head for the Genealogy society at the local library. Here they told me that this is the original place the Reilly’s came from but staff were unable to make any links to the family tree my father had drawn up for me. I received directions to the oldest Catholic church in town to investigate the cemetery. I had a good look through the church and grounds but there was no cemetery and the church was empty other than for 3 tourists. With nothing to lose and knowing it was a long-shot, I asked them if they knew where the cemetery was. Another bit of good fortune.....turns out these 3 were part of a group of 6 USA Reilly’s who had travelled to Cavan to do precisely what I was hoping to do. They were however better resourced than I and had been in the area a few more days. They suggested I make a trip to O’Reilly Castle (which I’d never heard of) and supplied me with the name of a farmer and tourist operator who may be able to help me get there. Within 2 hours I had taken a bus, disembarked at Butler’s Bridge and walked through 1 hour of heavy rain with a heavy backpack and food supplies until I found this farmer and his canoe hire business. It was getting too late in the day for a visit to O’Reilly Castle but after providing the farmer and a staff member/part time historian with my background, I was surprised to receive a load of info about the O’Reilly’s. There was enough time in the day for the farmer to drop me off at nearby Drumlane Abbey which he suggested would be of interest to me. 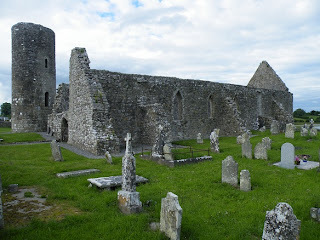 This 6th century ruin and surrounding ruins is small but has a very old cemetery with an amazingly high number of Reilly and O’Reilly graves. The oldest marked grave is 1715 with burials from the 6th century to 1700 being unmarked. This cemetery is still in use today and continues to see Reilly’s and O’Reillys being laid to rest - suggesting there is still a strong local population of Reilly’s. I was beginning to feel I had stumbled into the right area. The farmer was also kind enough to provide accommodation for the night although I had to walk back to his farmhouse from the Abbey which took 1 and a half hours and was undertaken in very ‘wet’ rain! 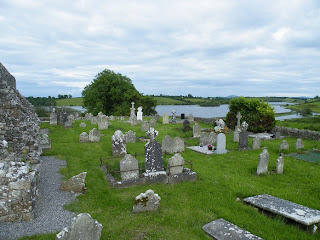 I didn’t mind because as I walked along the quiet and skinny lanes on the edge of the Lough Erne river /lake system I knew I was walking through my ancestor’s country. 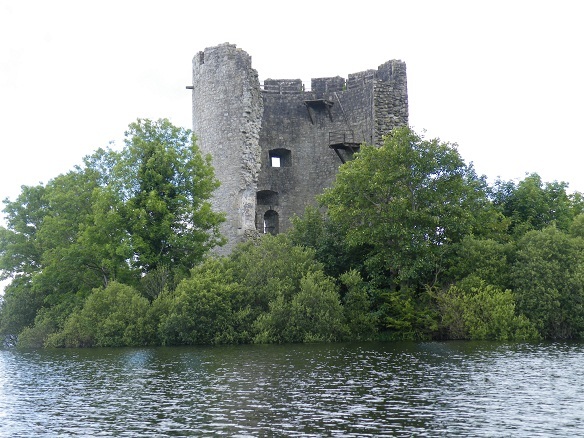 The next morning I found out O’Reilly Castle (Clough Oughter) is on a man-made island in the Lough Erne River and getting to it is a bit tricky. The farmer/tour- operator who was flat out carting silage, gave me a map of the river system, a brief run-down on how to operate the outboard motor, pointed me towards his boat and wished me ‘good day’. 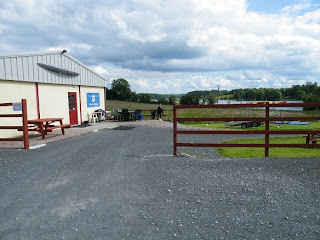 I successfully navigated the 6hp dinghy up the Erne River until I discovered O’Reilly Castle. 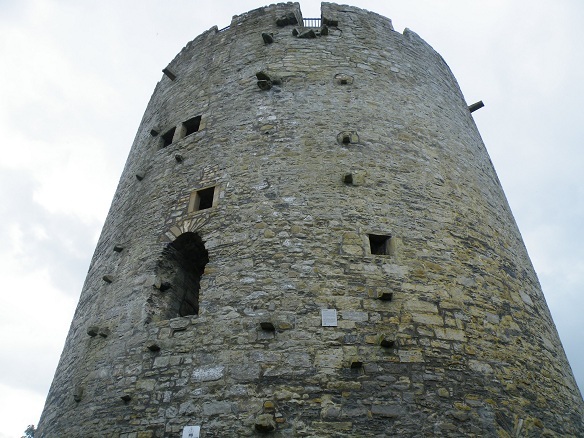 It is an impressive structure standing 18.5m tall and dates back to c.1221. 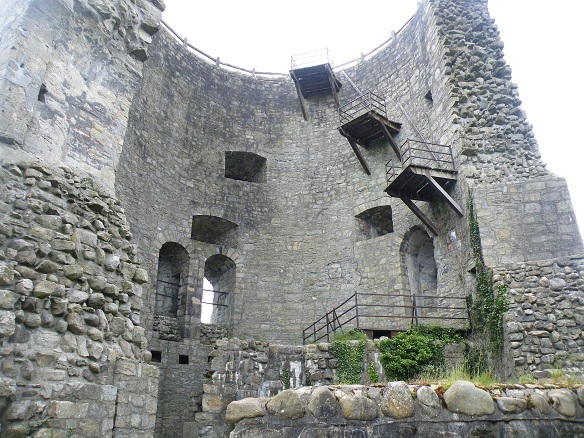 This castle/fortress was originally built by the invading Normans as they were looking for a stronghold so they could attempt to conquer local O’Reilly, O’Rourke and O’Neill clans and seize their land. Soon after, O’Reilly defeated the Normans and subsequently used the fortress for protection and as a prison for centuries. Sounds like there has always been conflict between the neighbouring clans. O’Neill took over the fortress in c.1646. In 1653 Oliver Cromwell’s troops attacked the fort, destroying it with canon-balls as they gained control over the lands and subsequently gifted land to the English landlords and Scottish farmers. The fort has not been lived in since that time. 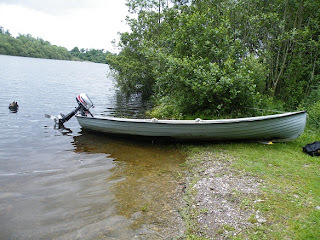 Note: there are a few man-made islands along the Lough Erne. It is believed these date back to the stone-age when protection was needed from wolves and bears inhabiting the surrounding forests. The local historian gave me fantastic background on the O’Reilly clan. They were an ancient race which inhabited that area and ruled over East Breifne for centuries. They were pagan but later integrated Christianity. An attractive culture but warfare was a necessity of the times in order to protect land and livestock from neighbouring clans. Human habitation on the Lough Erne waterway can be traced back thousands of years. After spending time at O’Reilly Castle I was back in the boat and going further up the Erne to the site of some megalithic tombs. 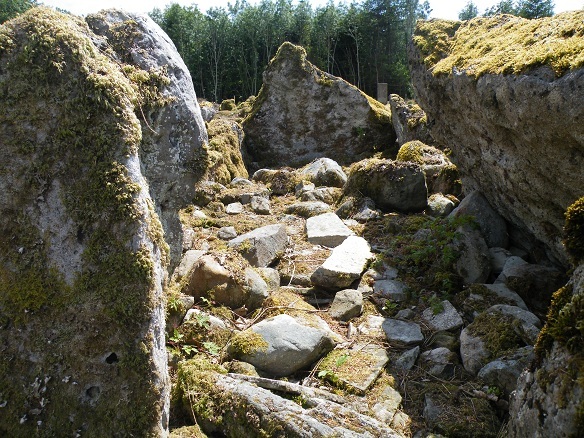 I pulled the boat onto the bank and trekked through forest to find the site of these ancient tombs. The historian suggested there is a strong probability these tombs belong to the O’Reilly clan as it was in their territory of East Breifne. 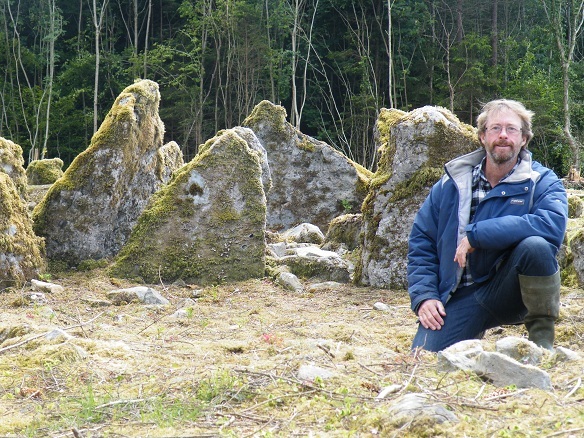 Incredible for me to think ‘here I am at the burial site of my ancestors dating back to the stone-age’. Another local farmer I spoke with suggested they could be as old as Stonehenge. I was even lucky to have found them as they are in amongst a newly harvested pine plantation with no signage and don’t appear on any tourist map. The whereabouts are only known to a few. Apparently these tombs would have been much larger and more impressive but over the centuries large slabs of rock have been removed for farm dwellings. There is otherwise no rock in the immediate area for some 20 miles which makes the construction of these stone tombs all the more impressive. My surname of Reilly originates from O’Reilly – apparently the O was dropped by personal choice to avoid religious persecution. What a remarkable few days. After arriving in Dublin on a whim and no idea of where to start, I had discovered and walked and navigated through the country of my ancestors. I had visited their Christian and their Pagan places of burial and entered their fortress - O’Reilly Castle. I witnessed from the high living population of Reilly’s in Cavan that the Reilly clan still lives on today in East Breifne. Had also importantly gained a sense of where my people come from along the Lough Erne River over which they ruled through ancient times. I have collected a published history of the O’Reilly clan and plan to share this account with the rest of my family, particularly the younger generation, knowing regardless of how hard we think we work and how tough things get, we have it easy in comparison to the events which shaped our family’s history and immigration to Australia. 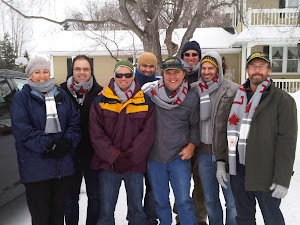 What a great post on your quest & journey to finding about your Reilly ancestry. I only with I had done some per-research before my cousin, son & I made our trip to Ireland back in 2011. As we were preparing to leave Ireland while in town, a shop owner asked aren't you gong to see your castle? You megalithic tombs was an awesome find... And I'd trek the island to find them. Hopefully, some day I will be able to take both my boys there for an gemology adventure! Hi, we have since found some more information on the history of the Reilly's including a published book. If you're interested send an email to reilly@gurradowns.com.au so we can send you what we have found. Regards. I am an O'Neal, but I still am encouraged by what you found. As with your family, my immigrant ancestor is where the trail goes cold. I have heard there are still many Clanaboy O'Neills in Antrim, and I hope to have the luck of Reilly when I get there.